Vijay Mallya: I think the race and strategy went very well for us. Without Paul's incident we were looking at a potential sixth place finish because he was running ahead of Massa in any case. It shows the vast difference between what happens in qualifying and what happens in the race. We always knew after free practice that we had a bit of race pace and it came through on Sunday. With six races to go, what's the key objective in the final few races? VM: The objective has not changed. McLaren have a points lead over us, but they are not totally out of reach. As I've said before, turning on the tyres is paramount and we are working hard to achieve this. There are a lot of points on offer and we need to try and regain the performance level we showed in the first part of the season. What are your expectations for Korea? VM: It's never been our strongest track, although we did score some points there last year. It's quite low-grip and the cooler temperatures make it a very different challenge. We will go there ready to learn as much as possible, try and improve our qualifying pace and come up with a smart strategy for Sunday. Paul, a week on from Singapore, how are you feeling? Paul Di Resta: The disappointment still feels quite fresh. When you have a race like that you just want to get back in the car as soon as possible. After the race I went back to Europe for some training and to get myself ready for the final push of the season. October will be the busiest month of the year so it was good to have some quality time at home before we spend the next couple of months travelling. Is the Korean track one that you enjoy? PdiR: It's an unusual track, but definitely a place that I enjoy driving. The three sectors are all very different with long straights linked by hairpins, some high-speed corners and a slower technical part of the lap. The tyre choices are the same as in Singapore so it will be interesting to see how they perform. We've always gone well on the supersofts, but struggled more on the medium compound so hopefully we can switch it on this weekend. 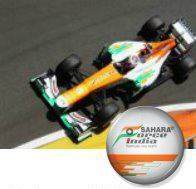 Adrian Sutil: It was a lot of work for one point, that's for sure! In the race I started on the mediums to do something different with the strategy and that worked out quite well. In the closing laps I was right on the back of the train of cars fighting for points. My tyres were so worn that it was hard to push, so getting a point was a good feeling after a long race. Tell us about your thoughts on Korea? AS: I quite like the track and I'm looking forward to it. I haven't been so successful there yet, but I want to make up for that this year. The circuit has a nice layout and a nice flow in the second part of the lap with some high-speed corners. Let's see how the supersoft performs because the corners are very hard on the tyres. That could open up some interesting strategies.